Coming soon to Concord -- a community-wide clean up effort. As the budget is cut to offer only those most important services, the community is taking the initiative to fill the gap. 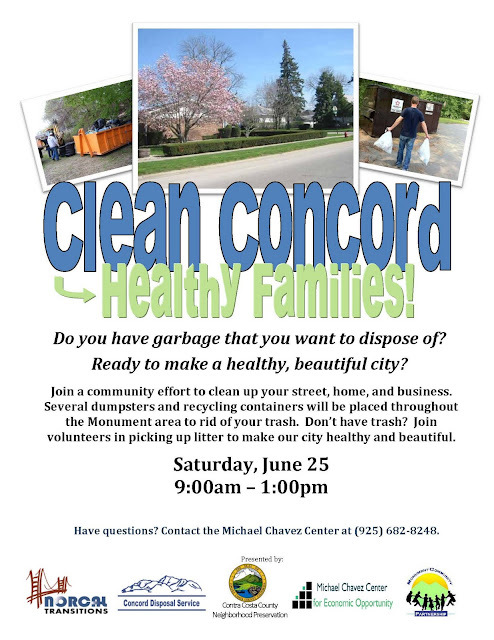 On June 25, in a wide-reaching effort, volunteers from all over the community will come together to clean up one of Concord's communities. Thanks to the many partners for this event, dumpsters will be placed throughout the Monument area where people can bring trash from their homes or businesses. The plan also calls for some volunteers to work on cleaning up the streets. When the idea came up, the members at the Chavez Center were eager to take action. They jumped at the opportunity knowing that it would benefit themselves and their families. When deciding on a name for the event, they wanted to highlight this idea to point out just how important clean communities are. It's not just an aesthetic appeal, but a personal impact. The community needs your help in cleaning the city for healthy families. There will be plenty of ways you can lend a hand. Join our event on facebook to find out more information! Or call 925-682-8248. Pass it on! Print this flyer and share with your friends! Why is Green so Popular?